Family Owned and Operated HVAC Contractor that has had the privilege of servicing the Bay Area and surrounding area’s since 1983. We specializes in all phases of Residential and Commercial Heating & Air conditioning, Rain Gutters, and Home Performance. We work with homeowners and General Contractors throughout the Bay Area and make it a point to deliver a great job every time we serve them. A1 provides the best services for you and your home all year round. 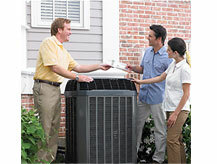 We work hard to stay the leading HVAC contractor for your central air conditioning needs. Whether you are looking to install brand new gutters in your home or repair your old ones. A1 can repair existing gutters or simply install new ones. *Based on 3 ton air conditioning system. On approved credit. On select equipment.